I was a bit worried about what Labour might do. I worried before the question was set because it was clear they could adopt Devo Max as a principle, “insist” on its inclusion as a third option, meanwhile start working on the detail to suit themselves and over the last couple of years run away with the polling and benefit from the oxygen of anticipated referendum victory and even a chance of winning at Holyrood again. They blew it. Today was the chance to retrieve that loss by astounding us all with the scale of their ambition and rewriting the No campaign by shoving a pie in the Yes face. They blew it. Again. Labour is pathologically inept. It is now the living embodiment of Johann…conservative, parochial, backward, deferential and unqualified for its role in public life. Not only is the level of their offering restricted, it makes the fundamental campaign error of being incoherent and therefore too complicated to sell on the doorstep. Is income tax devolved or not? How much? At the top end or at the bottom? Or both? Can the upper level go up AND down? Do other rates have to rebalance? How much will it raise and what will it be spent on? A policy you can’t describe is a failure. What does it say to Labour voters whose incomes have fallen, or to those whose benefits have been cut or who can’t afford to eat? We’re fiddling around with some parts of income tax and we’re getting an extra £1000 a year from the 100 Scots earning more than £100,000…so that’s the Celtic squad taken care of. Welfare is what Labour voters would liked to see in the hands of the Scots but that has been cherry-picked to include the bedroom tax which as been effectively neutralised anyway. Leaving almost the full range of benefits in the hands of the Tories is a vote-loser. Corporation tax would have been a logical adjustment – it’s already mainstream as an idea in Northern Ireland – but Labour’s timidity in differentiating Scotland gives the game away…they are resolutely British first. The same applied to air passenger duty. It’s a no-brainer for developing tourism, one of our biggest industries. So it would create an anomaly in the UK but aren’t anachronisms what the Union is all about? This is low level stuff in terms of the UK economy and in terms of the debate – it’s like control of air guns – but still they flunked it. This is a package defined by what it doesn’t offer rather than what it does. Not only does this miss the target, it wont even be part of a united Unionist package before the referendum, adding to the sense of confusion and lack of commitment they offer. I am a relieved man today. Derek it is clear that Labour are utterly devoid of any intelligent thinking, They are driven by their hatred of Alex Salmond and the SNP and are blind to any option that doesn’t follow that line. They are simply the Tories useful idiots. Summary: All taxes remain reserved except some income tax. But if you raise it, we’ll take it off the block grant anyway. There’s other stuff about but it’s all meaningless waffle. And none of that can even be considered anyway unless Labour wins the next general Election. I take it you mean “relieved man”. Wait till you see the BBC take on this! Surely it couldn’t be “more powers guaranteed for the Scottish Parliament” – now that would be “relived”. It’s woeful in every respect. How do they imagine this is going to go down with voters? “they are resolutely British first” I think you are wrong. The are party first, British & everything else second. Right Thomas….what drives them is Tribalism not policy. Labour want to run things….not change things. The are party first, British & everything else second…. with the exception of Scots… which easily comes after everything else, if at all. Good summary Derek so will look forward to this unguaranteed offer of almost zilch being taken apart by the BBC and MSM. Over to you Brian Taylor! Derek’s thoughts on Labour’s piss poor Devo Mini offering largely mirror my own. The party is killing itself in Scotland by making a grab for power in London its priority. After a week in which they fell over themselves to pay tribute to Tony Benn (yes, a unionist, but a principled one), it’s shocking to see how little they care for the working class North of the border. I ‘d expand that. I think they care little for the working class, regardless of whether they are north or south of the border. Yeah, I wouldn’t disagree with that. I think the word we are looking for is contempt, utter contempt for the Scottish people and self preservation of Labour councils and more importantly the Westminster gravy train for the SLAB faithful. Becoming a Westminster MP is now a process which involves giving up on any idea of innovation, serving the public or improving society for the ‘greater good’ of your party. Hence the narrowing down of the political spectrum at Westminster to the point there is no difference between any of the main players. Is it any surprise we get this menu from Lamont which reads like a Fawlty Tower’s high cuisine evening – you can have the chef’s surprise, everything else is off. More likely the Monty Python Cheese shop which is devoid of any of the fermented curd in any respect. The Tories, Libdems and Labour are more Hot Fuzz, Best Town Committee, protecting vested interests, than insightful, challenging or forward thinking. UK Party conferences are where the walking dead of the political world go, to pretend they have a life. The UK Parliament is dead – it is just waiting for some one to tell it to keel over. Let’s just do that on the 18th September. They are cushy jobs at Westminster first, party second, everything else but the people third, and the the people, which they are supposed to be serving and representing, a long long way behind last. The Labour Party in Scotland is not a political party but an exclusive club for the provision of ‘jobs for the boys’ and the enhancement of its members’ life styles and chances. I sincerely hope whatever the result of the Referendum that those who have supported the NO campaign will be cast into the political wilderness. Yup. Couldn’t agree more, James. If giving the Scottish parliament the ability to raise 40% of it’s taxes is now a good idea,why wasn’t this done from the outset. We can all now see that devolution is Labour’s response to the continuing threat of independence and that it is only this threat that has extracted,unwillingly,promises of additional powers for Holyrood. At the end of the day,their nation is the UK and they will not propose anything which allows Scotland to diverge in any significant way from the rUK. If people want to see a more egalitarian society in Scotland then devolution is clearly not going to deliver this. Thank you Labour for clarifying this matter. The 40% is coming from income tax, not a range of taxes. And the sting is that this control over 40% of income tax will be mirrored by a similar cut in the Barnett formula, which will therefore mean at best no more money for Scotland but more likely a real cut in what the Scottish Government has to spend garnished with all the negative publicity associated with being able to raise (but curiously not lower) income tax levels. We desperately and urgently need to be rid of the Labour Party (I speak as a socialist). But isn’t it wonderful that the grand work of destruction is being done by they themselves? If there is a god, he has a ruthless sense of humour. Did not the ancients say that he who the gods wish to destroy they first make mad? Cometh the hour, cometh the woman: Mad Johann. We need a slight rearrangement and a compliant whale . . . No, that was not a Jackie Baillie reference, compliant is not a word I would use of her. haul ) are , as far as I am aware , the subject of ongoing discussions . So it can be done within the current UK structure ; always assuming there is the will on part of the negotiating parties . Maybe you could get Steven Purcel back on in a day or so to comment on this document! A good idea but maybe he would give them some room for “clarification” if it was right away- best to leave them to fully stew in the juice , continuing to add to the soup – layer after confusing layer – then bring back Purcell to view it from a wee distance??? Well Derek, how about if I share a little secret with you that you seem to have missed? SCOTTISH LABOURS proposal didn’t come from the group of Scottish MP’s MSP’ and MEP’s, but came from the Labour Party Leadership in England, who were very mindful of how the proposals would be viewed in the places that are important for Labour to win the next General Election. There’s already a growing resentment that the referendum is winning the scrounging jocks a better financial package from the coalition than the Ruk, so Labour had to avoid any chance that they would be seen to pandering to us winging gits up here. The fact that they did not tell us Scots the big Devo Max Lie, is clear evidence of interference from Labours Westminster Masters. Oh Jeez, car crash policy. 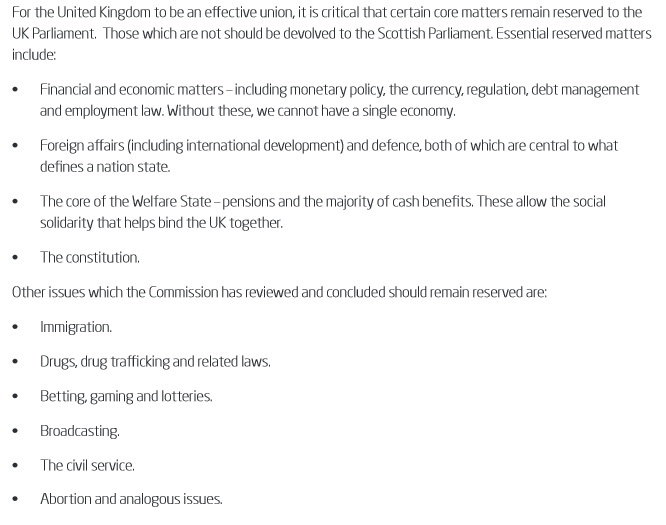 Mind you there’s a fair old list of what absolutely cannot be devolved. Basically all the stuff you actually need for meaningful government. Now mibbie just me but I don’t see devo max here. Devo tax (burden) perhaps, but no devo max. The current crop of parliamentary Labour politicians have YET AGAIN failed their electorate. Not so much a case of must try harder as clean house, get shot of, enema required. Mind you there’s a fair old list of what absolutely cannot be devolved. Basically all the stuff you actually need for meaningful government. Exactly! It is being denied to the electorate in Scotland by Red Tories, who are only interested in maintaining their careers and patronage networks. I think the reason given for APD being devolved to NI was to compete with Eire. The dependinistas will never devolve it in totality to Scotland as the North of England (the bit 150miles further north than the north) would be up in arms. This is an atrocious ‘offering’ to the voters of Scotland. Trident remains at Westminster, Welfare powers reserved (Bedroom Tax, on going cuts in benefits, ATOS), Immigration reserved (when we have an aging population), all the major taxation powers reserved (apart from 40 per cent of Income Tax: what is the point in having control of 40% of Income Tax, and not 100% instead anyway? ): this includes corporation tax, majority of income tax, VAT, national insurance contributions, alcohol, tobacco and fuel duties, climate change levy, insurance premium tax, vehicle excise duty, inheritance tax, capital gains tax, and tax on oil receipts. In addition, broadcasting, foreign affairs, abortion, betting, lotteries, drugs, drug trafficking, the constitution etc are, just like the vast majority of most Welfare and taxation powers, ALL RESERVED TO WESTMINISTER. Utterly, utterly useless from the ‘leadership’ of the Labour Party in Scotland. This is completely intellectually bankrupt, and an insult to the electorate in Scotland. It offers no hope whatsoever, during a time of acute social and economic turmoil, for many people in Scotland. Shoddy and a dog’s dinner does not do this justice by a considerable distance. Surely even BBC Scotland won’t be able to polish this turd for Labour. Want a tenner on that? I’ve watched them polish larger, browner, sleeker and steamier turds than that. Do the words ‘Iraq’ and ‘Palestine’ ring any bells? From what i saw the BBC (Scottish lunchtime news) tried its best, maybe not to polish it, but certainly to ignore it by tying it all up into a piece about ‘6 months to go until voting day’ of which Labour’s announcement was buried in amongst some other nonsense. Remember the launch of the White Paper ? We had extended news coverage, Nick Robinson came north of the border, live broadcast from outside Holyrood etc etc. What do we get for Labour’s devo report ? Brian Taylor mentioning in it in a 30 second piece to camera in Holyrood in which he also mentions David Bowie. I look at those serving in parliament for Labour with a mixture of amusement, confusion and sympathy. What a backward moribund lot they are. No vision, no talent, just an inbred tribalism, unquestioning deference to the Union and a hatred of the SNP accompanied by paranoid delusions and an almost pathological revulsion to the sight of Alex Salmond, a man whose very presence or mention is enough to have the blood pressure of any Scottisn Labour person soaring. I grew up with a tremendous respect for people like Donald Dewar, someone who I was never in any doubt stood up for Scotland and articulated a positive, at times almost inspiring, vision of Scotland within the Union which is so absent today. This is an air punch day today again for the SNP and YES more generally. Even the pro-union media is going to have great trouble trying to work out the incoherent mess of varying devo-something policies and weaving them into a convincing NO narrative. It can’t be done, and when the Euro election results come out and the full scale of UKIP’s influence down south is brought home to people in Scotland, the momentum will build further. I was thinking the other day, what have they got left? The currency consensus was supposed to knock YES back on to the ropes, a blow from which we would never recover, if not a knockout punch, then a lingering defeat as we were constantly pressed back on the defensive. Yet, whilst the media never tire of bringing it back up, and whilst there is little doubt it is our weakest point, it hasn’t had any noticeable negative effect. Coherent, ambitious plans for more devolution would kill off independence, I have no doubt about that. The soft middle ground and undecided would vote for it as they could console themselves that they were not voting for a position which sought to belittle Scotland at every point, but at least promised an evolution of the devolution journey. Now they are left with a stark choice, and I am sure in the end they will vote YES. But what have they got left? I don’t see anything that BT can come up with between now and the referendum which will scare us. We have ridden out the company results and the spring conference season, we have taken the currency whammy and responded vigorously. There is nothing to divert us now from selling the positive message to anyone who will listen. I find it hard to imagine any way in which BT can recover the momentum. Especially when we are entering a summer where Scotland will showcase itself to the world in a far more positive way than it has done for a generation. Only YES can inspire and offer vision for our future…. Really? Donald Dewar? Not this again. Donald Dewar was a career politician who happily helped to set up the voting system for the Scottish parliament with the fond intention that the SNP would never become a majority government and bring about the situation we have now – a referendum for independence. He also was behind the redrawing of the border so that 6000sq. miles of the North Sea would be gifted to England. Is that someone with Scotland’s interests at heart? again behind their backs. Shameful. Dewar was lauded far beyond the actuality and what he actually deserved. The cost over-runs of the Scottish Parliament building are down to him and his mad ideas, despite not having a clue about building processes. He was though head n shoulders above any of the intellectual nonentities that LIEBOOR have today. I never said Dewar was a saint, crikey me! All I was saying is that he nevertheless was able to articulate a positive vision of Scotland within the Union which had a broad appeal at the time. He did so with a personal gravitas that is far beyond any of his successors. I am well aware of some of the shambles of the early years of the parliament…anyway this is very old ground, and I see no need to rake over his other shortcomings. Did I doze off? The Constitution? I didn’t know there existed a UK Constitution, when did that happen?Custom and practise, a Black Rod,and a mace. The Queen opening Parliament, folk in uniforms I know we have that, but a Constitution? Oh indeed, it is embodied in Lord St John of Fawsley. When he shuffles off this mortal coil, unless he already has and I didn’t notice then like the Thibetan Lamas the animating spirit will come down on another, Nicholas Witchell perhaps? With such custodians who could possibly be concerned for it? Nothing to see here, move along please. Pity the poor sods that have top sell this on the doorsteps. No matter the result in September, the Labour Party faces huge challenges in Scotland. Devoid of quality leadership, lacking principles and only capable of parroting a Tory-lite vision created in London, they are unelectable in Scotland. As a lifelong supporter it depresses me to say that I can never see me voting for Labour ever again. Scotland has supported Labour through thick and thin for the last 60 years. Now when the people of Scotland are being ridiculed and belittled by Westminster and the EBC/ MSM is Labour protecting or thinking of the Scottish people? No they are the first unionist party in there with a knife in our back, treachery is their game. Self interest, greed, contempt for the people of Scotland and betrayal of the people who stood by them. Enough! Scottish Labour – Too Poor in ambition – Too Wee in stature – Too Stupid in thought. Well Labour are known in certain circles as the MOST deceitful party, reading this article and that on Wings will show you all you need to understand just why they are called that. They cannot change, they do not want to change, but they do want to deceive. So relieved Labour has come up with nothing that would draw people away from the Yes vote. The most significant thing about this story is that BBC Scotland has buried it without a eulogy. I’m not a fan of Labour. Along with the Tories they do seem to have the ruthless ambition to spend all the money they can get their hands on and permanantly leave the country in debt. Remember that wizard wheeze to buy schools and hospitals on the never never from their pals in business? It doesn’t tackle poverty at all and seems disinterested in making real changes. In Glasgow it was desperate to build a railway to the airport for the Commonwealth Games. I wonder how much that would have ultimately cost? It’s all about vanity and self interest and most old Labour supporters have seen through that now. If they don’t buck their ideas up there might be a long time before they are trusted to govern again. The UK government were basically conned in NI into devolving APD for long haul flights . But the point is the UK. Gov. agreed the concession . There is a major flaw in the point you have made . The North of England , whilst deserving of all the aid it can muster , remains a region of England . And with the North East in particular having turned down a form of regional devolution their argument remains with Westminster . Whereas Scotland is a nation with a devolved Parliament which Westminster basically treats as little more than an irritation and at the same time a much needed milch cow in respect of taxation . Newcastle , Leeds/Bradford and Liverpool will , with the support of airlines , certainly use the anomalous NI argument in the event of an Indy ScotGov implementing the promised reduction in APD. So one way or the other air passengers from the North of England will be winners with an Indy Scot . I’m afraid the answer may be another war. 2012: The unionists remove Devo[undefined] from the ballot paper, calling it Alex Salmond’s consolation prize. 2014: Unionists are falling over themselves to have a Devo[minimum] offer. What on earth could have changed their minds? Didn’t Calman offer enough? Jim Murphy must be so chuffed as his pre-launch interview on GMS was such a resounding success that his followers only heard ‘Vote no, vote no’ as they scurried to feed from Mother Labours teat. To be fair to Labour, and I don’t want to be fair, they are totally hamstrung by the principle of fiscal equality across the UK and their “One Nation” mantra. Fiscal equality with other regions of the UK means they cannot go above Barnett formula funding levels for Scotland nor more importantly give it access to additional sources of revenue unless it comes from an increase in taxation, almost exclusively income tax. So the question always comes down to what new mechanism they will use to provide Scotland with its Barnett formula funding and how much leeway do they give any Scottish government to crank up income tax if it wants to pay more for its public services. The only mechanism proposed so far in every proposal is to let the Scottish Government collect bits of its Barnett Formula grant via taxation and then top it up to the final level from Westminster instead of Westminster just handing over the full grant in one go. The final amount is always the same. Scotland cannot be given more money for welfare payments than any other region of the UK and the “One Nation” policy makes differentiating welfare payments across the UK a no-no anyway. The same principle applies to corporation tax and APD. So Scotland will always get Barnett Formula funding for its public services until they switch to a new formula which reduces Scotland’s grant which will probably happen very soon after a no vote. That is the one and only future for devolution in Scotland. Once you understand the model and that every devolution proposal so far has simply been about changing the mechanism of delivering Scotland’s current Barnett block grant then you understand that we are already at devo-max because devo-max is the maximum amount of power that Westminster is willing to concede to the Scottish Parliament. Anyone who expected anything else hasn’t been paying attention. Excellent, well written article, you have got the bug Derek, or is it called the Independence virus! So we are facing a future in the UK of putting all our resources into the common pot, as it was before we were given the devolution deal which was forced out of them by the SNP threat. The only difference being is that they are now welching on the Barnett Formula which was shamefacedly set in place to offset the total consumption by Westminster of all that Scotland could produce. What Prof Bleak Midwinter and his scurrilous crew have come up with after three years of navel-gazing is this concoction of hot-air farcically packaged it up as somehow an advantage for Scotland to tax its own people on top of still sending all its wealth to London, keeping Trident nice and cosy in Faslane and ridding itself of all the stress and worry that the curse of oil brings. If the Scottish people, and this is particularly referenced to the women and the youngsters coming through to face the future, do not vote to spurn this cynical nonsense from Westminster, we are indeed a lost nation and deserve no better than what’s coming down the line to slap us all on the back of our oh so stupid heads. We should, must and will vote YES.